Khorosho Productions: Mei-Lin 2.0, Fembots and Heroic Scale Heads all now on sale! Mei-Lin 2.0, Fembots and Heroic Scale Heads all now on sale! Statuesque Miniatures is pleased to announce our latest set of new releases! First up is renegade gynoid operative Mei-Lin Mayfair 2.0 and her Hong Kong Killer Fembot companions. Mei-Lin is priced at £4.75 and comes with two head options. The three figure Hong Kong Killer Fembot set is priced at £10 and features interchangeable heads and guns and two head options for each figure. For a limited time only, you can get Mei-Lin and six Hong Kong Killer Fembots for only £20, saving up to £4.75 over buying the items separately. This offer will run until the 9th of February or while stocks last so don't delay in picking yourself up a Fembot bargain! 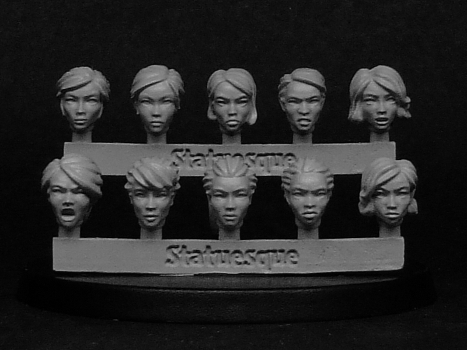 Also released this month is the Heroic Scale Female Head set. 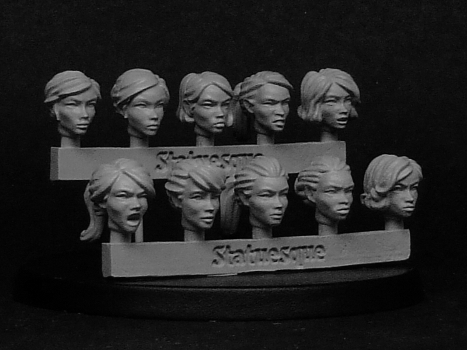 Featuring ten female heads, this set is designed to allow you to convert your heroic scale figures. The set of ten heads is priced at £4.75.